Last week I had the opportunity to attend Governor Cuomo's budget address held at Syracuse University. At this invite-only event was a small gathering of people. Those in attendance were two superintendents (including me), CEOs and top level administrators from area Universities and hospitals, students from both Syracuse University and the Syracuse City School District, elected officials both past and present, and a sprinkling of "citizens". Until this presentation, the best public speaker that I have seen has been President Obama. I wouldn't say that Governor Cuomo is a better speaker than the President, but I would say that he is pretty close. He spoke for about forty minutes and laid out a budget plan that calls for job loss, consolidation, and pain and he did so with candor, humor, and just the right amount of fist pounding passion needed to get his point across. I sunk in my chair a couple of times during his presentation. The first was when he spoke about education and his estimation that there has not been any return on investment in education and that our children are not getting any smarter even though the state keeps giving money. He indicated that schools are not going to get additional money until they prove themselves. He received a loud ovation. He then indicated that superintendents make too much money. Again a rousing ovation. When he finished with his entire speech, outlining changes to all areas, he received a long standing ovation. I walked away from the event with the clarity that people are appreciative of his budget tightening efforts and are ready for change and reform. As a leader I will carry the charge and make things happen, but it will be interesting if the Governor gets the same appreciation when parents see all that will be lost for next year and beyond. One thing that separates me from others is probably that I do not dwell in negativity. I do not have time for that. I prefer to take the information that I have and make the changes necessary to fit within the parameters that I have been given. I do advocate, make phone calls, and lobby just like every other leader, but I also prefer to make change instead of reacting to change. If you have followed our budget building process you will see this philosophy reflected. Something that struck me as odd over the past few weeks is being asked why I asked food service workers, custodians, cleaners, and bus drivers to take a wage freeze along with the rest of our employees. I hear that "they don't save enough to make it worthwhile". Everyone matters. When a bus driver gets a cold or I get a cold are they different? Do we shop at the same stores, talk to the same people, attend the same events, and live in the same community? Yes, yes, yes, and yes. Why then, would I not want to include them in our District effort to save jobs and opportunities? We are the West Genesee family, and we do things together. This is more important than money saved any day. This weekend is the third-annual Culture Fair. We are excited at all of the different cultures that will be featured, and I am really looking forward to the opportunity to interact with many different community members. Have a great week and I will see you soon. I know that we think of teenagers sometimes as mutants who wear the same shirt everyday (even though there is a closet full of others), make goofy noises, and define a perfect evening as one spent in the basement playing video games all night with their friends. Our house is the usual weekend hangout for several of my boys' friends and this past weekend was no different. On Saturday night there they all were, relaxing in front of the X-Box, making goofy noises and eating everything that the pantry had to offer, when I yelled down the stairs to see if they wanted to see the full moon. Up they came one after the other, wide eyed and excited to see the largest full moon in twenty years. Not only did they come to the window, they put on shoes and sweatshirts and went outside to get the best view possible. Some took pictures with their cell phone cameras and some just said, "Cool!". Moments later they all descended back into the basement, but I paused and was pleased to know that there are still little kids in those lanky, goofy noise making, pantry eating teenage bodies. It was a good thing. 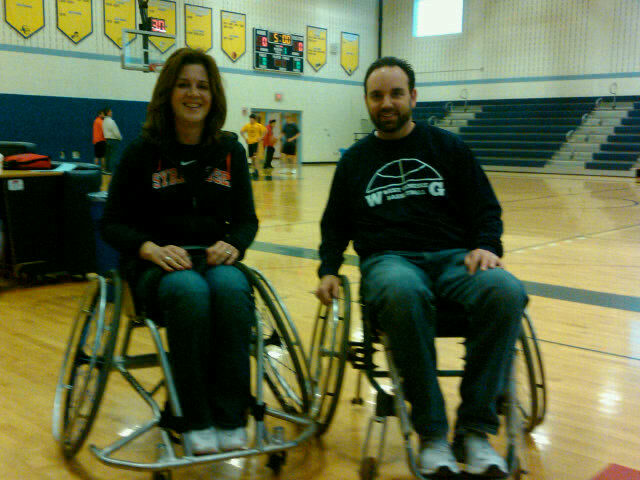 The previous evening Mrs. Brown and I attended and participated in a game of wheel chair basketball with high school students and staff. While I would have been happier if more people had attended, the message that we received was loud and clear. The organizers, Move Along, Inc., made sure that we recognized the challenges that students with disabilities face but also made us feel very comfortable and welcomed. I would love to support this type of event on an annual basis, and I almost wonder if it would fit into our District Culture Fair. Speaking of the Culture Fair, our third annual celebration of our differences is coming up on April 2. The t-shirts are great and can be obtained through the high school office. If you wear one you will be the coolest person within twenty feet of you. Imagine that. We have added a few new booths this year to the Culture Fair including Stop the Hate, Spread the Hope which is a grass-roots anti-bullying effort created by our students. The group will fit into our District-wide program shortly. Monday night is our National Honor Society induction ceremony, Tuesday is an evening with parents who have children with disabilities, and Wednesday is a prime time special on Channel 9 about the budget (in case you haven't heard enough about that) that I was asked to participate in. Exciting stuff and plenty of work to keep us all busy. 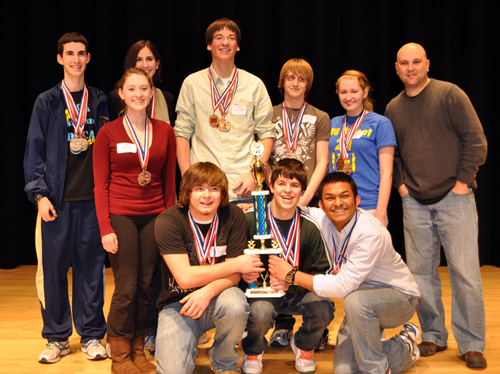 What do our Academic Decathlon team members and Michael Jordan have in common? ﻿﻿Answer-they both competed in North Carolina. That's right, our Academic Decathlon Team will be taking their talents to North Carolina after winning the New York State Championship over the weekend. As a reminder, this competition is for excellence in academics, responding to pressure, and having a personality. Our students have been competing for the state title for the past three years, and their hard work and response to Mr. Duda's demands have paid off. I am very excited to see how we do at the national level and will certainly keep you posted. Pictured in front from, left to right, are Alec Kearns, Kevan Spencer, and Jerry Roy. 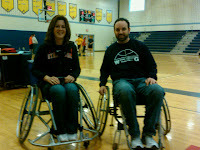 Thomas Brogan, Dennis (DJ) Campbell, Jennifer Smacher, and Coach Scott Duda. There were some great concerts last week, as well as a production of Hello Dolly at Camillus Middle School. Spring sports are now in full swing (no pun intended. baseball players), and the most updated game schedules can be found at westgenesee.org. I would also like to remind you that we have shared all of our budget information to date on our web site as well. I am not a big fan of surprises and neither should you in this case so please feel free to view all of our documents on our web site, and you can contact me with any questions you might have. I am hopeful to be able to announce updated information concerning our wage freeze around the middle of the week and besides that update, there is nothing new to report. Our bullying task force will be returning to work shortly to discuss and select from several different student anti-bullying programs that are available. We have also made the results of our recent bullying survey available to all of our staff and students, and as soon as I figure out how to make it available to you I will let you know. This week will be busy once again and full of meetings, building visits, budget presentations, and C.O.D.E. graduations. I am hopeful to see many of you in my travels. Have a great week and congratulations once again to our Academic Decathlon Team members and Mr. Duda. On Friday my family and I had to travel down to Kentucky to attend a funeral for someone very close to us. The drive alone is tiring (about nine hours) plus all of the emotion that comes with having to say goodbye to someone you really care for. Saturday was a pretty good day in Syracuse though. SU got a big win; Ben Seketa broke a school record in swimming; Bill Gabriel, John DeLallo, and Laura Leff ran well in track; and Jake Pelton saved 51 shots on goal in a four overtime effort against Williamsville North that ended with the Wildcats coming up just short. I had also heard that the Science Fair went very well at Split Rock School, and the Mr. West Genesee pageant was a great success as well. I went to bed happy for all of the kids and their efforts and looked forward to getting back home. On Sunday morning we were up bright and early and hit the road at 5:50 a.m. Our drive started out uneventful enough but then things got weird. Near Columbus we were not able to get to the on ramp that would get us to Cleveland. There were Police at each of the on ramps that we tried to use. We were then able to see nearly two dozen cars well off the road. Some were flipped, some twisted, and some looked like they had rolled. Black ice for sure. We found a bypass to get us in our correct route and about three hours into our nine hour ride my phone rings. It is our security service calling to let me know that the "waterbug" in our sump pump hole was chirping which means that something was clearly wrong. A quick call to my parents and brother-in-law lead to what I was afraid of. Our sump pump pipe had sprung a leak and water was spraying all over the basement. They were able to fix it but let me know that I would be coming home to "a mess". Awesome. Just then the weather started to turn to icy rain, then snow, then icy rain, and then rain. Cars off the road everywhere. Somehow we got ourselves home, tired, needing to grocery shop, and needing to clean the basement. The moral of the story is that never getting too high or too low about anything are the keys to staying composed. Things can always be better, or worse, and sometimes you just have to work through things to get to the other side. I use this lesson each day as I try to get the budget completed, make many changes that won't be fun for anyone, and still allow us to be on top academically. Since my last post our office staff, food service manager, and substitute teachers all agreed to our wage freeze proposal. All I can say is THANK YOU. We are only a few groups away from reaching our goal. Who else can say that? Lastly, on Tuesday I am going to be meeting with the high school students to discuss the results of our bullying survey, facebook, and our budget. Students are more aware than we give them credit for, and I really enjoy the opportunity to meet and discuss things with them face-to-face.